On the 4th (Sat), have some family-friendly fun at Bad Axe Throwing. To find traveler tips, where to stay, more things to do, and more tourist information, you can read our Denver holiday planner . New York City to Denver is an approximately 7-hour flight. You can also do a combination of bus and flight; or drive. You'll gain 2 hours traveling from New York City to Denver due to the time zone difference. Traveling from New York City in May, expect a bit cooler with lows of 43°F in Denver. Finish your sightseeing early on the 4th (Sat) so you can travel to Las Vegas. 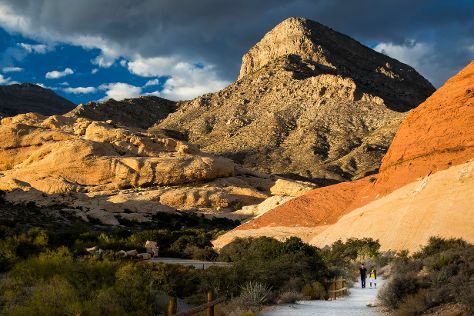 On the 5th (Sun), explore the stunning scenery at Red Rock Canyon National Conservation Area, take in panoramic vistas at Eiffel Tower Viewing Deck, and then ponder the design of Bellagio Fountains. Keep things going the next day: examine the collection at The Mob Museum, then take in nature's colorful creations at Bellagio Conservatory & Botanical Gardens, and then get a taste of the local shopping with The Strip. To find where to stay, maps, photos, and more tourist information, refer to the Las Vegas travel route planner . Fly from Denver to Las Vegas in 4.5 hours. Alternatively, you can do a combination of bus and flight; or drive. Traveling from Denver to Las Vegas, you'll gain 1 hour due to the time zone difference. Traveling from Denver in May, expect Las Vegas to be much warmer, temps between 87°F and 64°F. Finish your sightseeing early on the 6th (Mon) to allow enough time to travel to Los Angeles. 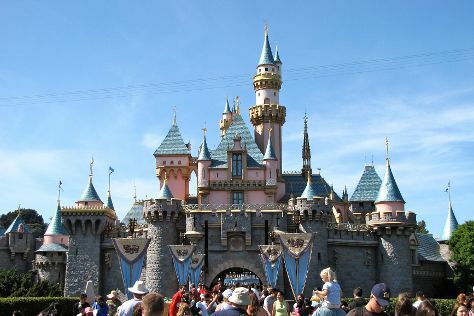 Change things up with a short trip to Disneyland Park in Anaheim (about 36 minutes away). Pack the 8th (Wed) with family-friendly diversions at Universal Studios Hollywood. And it doesn't end there: see the interesting displays at The Getty Center, look and learn at Griffith Observatory, take a leisurely stroll along Santa Monica Pier, and appreciate the extensive heritage of Hollywood Walk of Fame. To find photos, ratings, reviews, and more tourist information, read Los Angeles trip planner . Traveling by flight from Las Vegas to Los Angeles takes 4 hours. Alternatively, you can drive; or take a bus. Traveling from Las Vegas in May, things will get a bit cooler in Los Angeles: highs are around 75°F and lows about 59°F. Wrap up your sightseeing on the 9th (Thu) to allow time to drive to Sequoia and Kings Canyon National Park. Start off your visit on the 10th (Fri): hike along Lakes Trail in Sequoia National Park, then delve into the lush surroundings at Giant Forest, and then take a memorable drive along Generals Hwy. For maps, photos, where to stay, and tourist information, go to the Sequoia and Kings Canyon National Park trip planner . Traveling by car from Los Angeles to Sequoia and Kings Canyon National Park takes 5.5 hours. Alternatively, you can do a combination of flight, bus, and car. When traveling from Los Angeles in May, plan for somewhat warmer days and about the same nights in Sequoia and Kings Canyon National Park: temperatures range from 84°F by day to 55°F at night. Cap off your sightseeing on the 10th (Fri) early enough to travel to Grand Canyon National Park. On the 11th (Sat), take in breathtaking views at Grand Canyon South Rim, then hike along South Kaibab Trail, then take some stellar pictures from Yaki Point, and finally take in breathtaking views at Yavapai Point. On the 12th (Sun), you'll have a packed day of sightseeing: stroll through Bright Angel Trail. To find maps, photos, more things to do, and other tourist information, read Grand Canyon National Park trip planning site . You can do a combination of flight and bus from Sequoia and Kings Canyon National Park to Grand Canyon National Park in 9 hours. Alternatively, you can do a combination of flight, shuttle, and bus; or take a bus. The time zone difference when traveling from Sequoia and Kings Canyon National Park to Grand Canyon National Park is 1 hour. When traveling from Sequoia and Kings Canyon National Park in May, plan for a bit cooler days in Grand Canyon National Park, with highs around 68°F, while nights are much colder with lows around 33°F. Cap off your sightseeing on the 12th (Sun) early enough to go by car to Santa Fe. For photos, ratings, more things to do, and other tourist information, use the Santa Fe trip planner . You can drive from Grand Canyon National Park to Santa Fe in 7.5 hours. Traveling from Grand Canyon National Park in May, plan for somewhat warmer nights in Santa Fe, with lows around 43°F. Wrap up your sightseeing by early afternoon on the 13th (Mon) to allow time for travel back home.